Have you noticed that bowriders are getting bigger and bigger these days? There are now several manufacturers offering bowriders over thirty feet in length. And the reason is that consumers want them. Big bowriders can offer huge amenities for daytime boating such as enclosed heads, entertainment centres, full refreshment/galley centres, and loads of flexible seating along with incredible move-around and elbow room on board. Brand new for 2013 is Regal’s newest and largest bowrider, the 3200, with an overall length of 32’2” and riding on probably the widest beam in its class at 10’4”. Yet, at 9,000 pounds, it is possibly the lightest weight of all competitors this size per cubic foot. Power is supplied by twin-only sterndrive offerings from either MerCruiser or Volvo Penta from 600 to 760 total horsepower, some with electronic shifting, and a couple of the Volvo Penta engines even have Joystick control features. 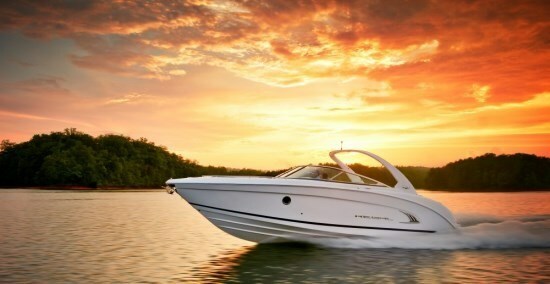 Choose your power right and you can get over 50 mph in this boat. Wow, have bowriders ever come a long way! And wait ‘til you check out some of the fabulous features on this 3200. 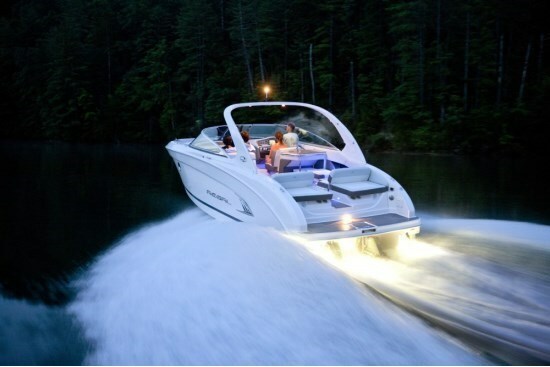 But first, let’s get up to date on Regal boats for 2013. For 2013, Orlando, Florida’s Regal Marine offers ten bowriders in its Sport Boat Class from nineteen feet to this new 32-footer. There are four models in its FasDeck series in two lengths, twenty-four and twenty-seven feet, all of which are also new this year. There are also four models of cuddy cabins from twenty-two to thirty-five feet. All of the above models up to twenty-eight feet ride on Regal’s award-winning and patented FasTrac® hull technology providing proven efficiencies, performance, and fuel economy. At the top of Regal’s line-up are seven Express and Sport Coupe offerings from twenty-eight through to its flagship 52-foot Sport Coupe. That totals twenty-five models in all from nineteen to fifty-two feet. But back to the new 3200. 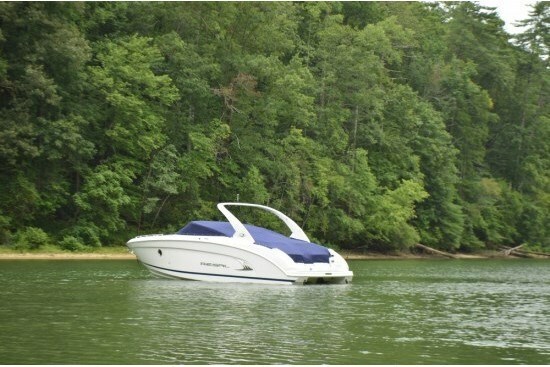 This boat is huge inside and is loaded with features to enhance your day boating experience. 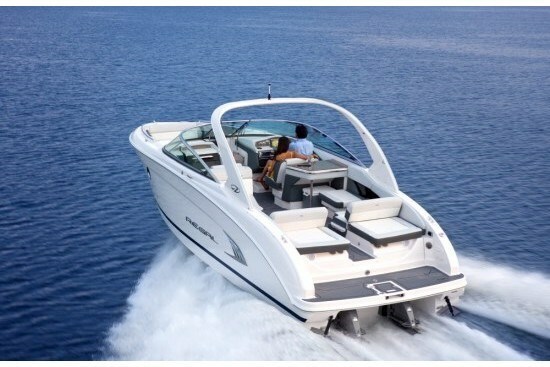 In Regal’s own words, “Regal created a whole new category with the introduction of the 3200 — Day Yachting. Yacht amenities combined with seating and lounge space for up to 18 – it’s the perfect platform for big water, big crowds and the best of open entertaining.” That pretty well sums it up, but let’s check out some specifics. Did you notice that claim from Regal? “…seating and lounge space for up to 18…” Truly amazing. Single, two, three, and four seating combinations abound. Both the driver and passenger forward-facing helm seats are double-wide. The forward-facing bow seats in front of these two helms are large singles or cozy double-wides – and both come standard with flip-down arm rests plus filler cushions to turn them into lounge seats. 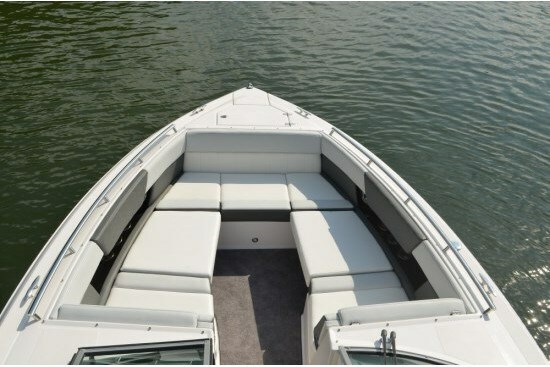 The aft-facing bench seat right at the bow is a comfortable three-seater. Behind the passenger helm seat is a rear-facing large single or cozy double seat/lounge. Opposite this and behind the refreshment centre is a side-facing single seat. Across the transom are dual, six-way UltraLounges with a cockpit-level walk-thru between them for swim platform access. These two UltraLounges each seat, or recline two adults facing either forward or aft, or fully recline as sunloungers – for a total of four adults! If you’ve been counting, that is a possibility of seating for eighteen should you ever need or indeed, want it. And to make life aboard easier and more comfortable, the cockpit floor is level from the swim platform step right to the bench seat at the very bow. Almost all seating has finished storage below. There are two additional in-floor storage compartments, one of which has stairs down into it for ease of access. I mentioned earlier about decent sized head compartments on these larger bowriders. The entire bulkhead in front of the passenger helm seat swings open on the 3200 into an almost stand-up compartment which would make many a small express cruiser envious. It features granite-like countertops, black cherry wood cabinetry, soft-step flooring, and a designer glass vessel sink. Other notable amenities include a waterproof Fusion 700 stereo with internal iPod docking station with full iPod control, 2.7” full colour LCD display, a VHF receiver and six, 200-Watt cockpit speakers. Regal’s PowerTower which electrically folds down for boathouse, low bridge, or trailering convenience is standard equipment as is the cockpit refreshment centre plus two on-board portable coolers. Notable optional equipment you may wish to consider depending upon the type of boating you do, may include full canvas enclosure, cockpit table, refrigerator, or even a gas grill, soft step mat or Flexiteek for the swim platform, docking lights, underwater lighting, or an anchor windlass, and more. This Regal 3200 Bowrider offers more seating and almost as many amenities and probably more room than a typical thirty-foot cruiser. And if you chose to use the fully-reclining lounge seats each as a double berth, you could sleep four and call it a full cruiser! Such is progress and such is the ingenuity of flexible design and out-of-the-box thinking.